This week we were lucky to have a visit from Erich's Dad, John, 'from out east'. Like we have said before, we love visitors, so this was a nice treat. In talking with him, I realized that we have forgotten to mention part of our story, as to why we chose to make our homestead in 'the Cariboo". The Zirnhelt's have a long history in this part of BC, dating back to Erich's great grandfather bringing his family there in the early part of the 1900's. Clarence, Erich's Grandpa, bought the store at 150 Mile House for $500 during the Depression. It was here that he met Erich's Grandma Harriet, who came to the region from Vancouver to teach at the local one room school house. They were married and raised their family at 150 Mile House. Clarence had an entrepreneurial streak and ran several businesses, from a hotel, to selling propane appliances to people around the region to getting involved in the fur trade buying local furs and selling to the Hudson's Bay Company. Clarence's brothers Henry and Al both had ranches in the area and their sister Marcella and husband Jack ran the local gas station. When I first went out to meet Erich's BC family, during our honeymoon, eleven years ago, I had the pleasure of meeting his Grandparents and was instantly entranced by the amazing stories they told of their lives in the Cariboo. 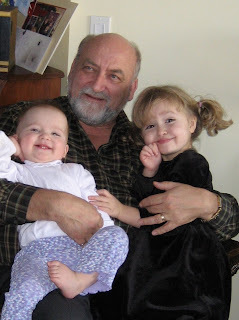 Erich's Grandpa was a gifted story teller and told of his days in the store, trading furs with the local "Indians", of running the post office and of the fire that burnt down the house they raised their five kids. We went out to Beaver Valley and drove past 'Uncle Al's' place that still stands (and is called 'Aunt Ida's' now), to visit the next generation of Zirnhelts living on that land. Recently, the fourth generation of Zirnhelts took residence in Beaver Valley. 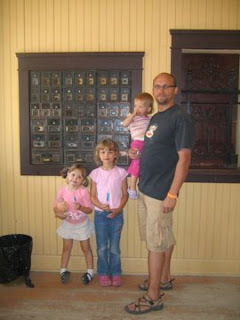 This is a picture of Erich and the girls in Barkerville, standing in front of the mailboxes that came from the store at the 150. As a child of immigrant parents, I am still fascinated by Canadian history and intrigued by the connection that the Zirnhelts have to this area. Last summer, we took our girls to the museum at the 150, that happens to be the schoolhouse where Erich's Grandma first taught. It was a very powerful feeling to be standing in the same place with my girls, as their Great Grandmother stood and where their Grandpa went to school some years later. This is certainly, part of the draw for us to this area. This summer the Zirnhelt Family Reunion will be held out in Beaver Valley. We are very excited to be able to attend. Wow, what a neat story. That is very cool that there is such family history in the area.